~With the signing of Jake Ryan by the Jacksonville Jaguars last week, Ted Thompson’s total 2015 Draft Class has been lost. Cast away. Going back to that 2015 Draft, and I remember it well, the Packers needed an inside linebacker and some help at tight end. They had just used their previous first round pick on Alabama’s Ha Ha Clinton-Dix, and it seemed like that spot was solidified. The Packers were slated to pick at number 30 as they had just come off the heartbreaking NFC Championship Game collapse in Seattle. Many of the Draft Experts (that is, the folks who get paid to compile data, opinions, projections, talk to NFL personnel, etc.) had the Packers taking one of the many highly-rated inside backers such as UCLA’s Eric Kendricks, Miami’s Denzel Perryman, Clemson’s Stephone Anthony, or Mississippi State’s Benardrick McKinney. All four of those inside backers went between pick number 31 and 48. Kendricks still anchors the Vikings tough defense and Perryman in the middle for the Chargers still. Anthony and McKinney didn’t pan out. 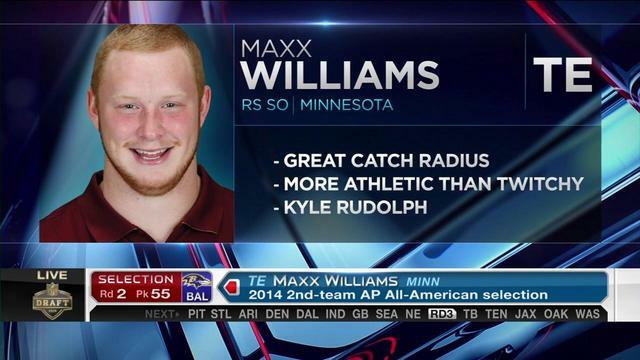 The other common player who was mocked to the Packers at number 30 was Minnesota tight end Maxx Williams. If I remember correctly, Mel Kiper and Todd McShay each had Williams to the Packers in at least one of their mocks, and a number of people from NFL.com and CBS Sportsline had Williams to the Packers in others. It made sense. Well four years later, a lot of players move on. The whole Packers Class of 2015 has, from Damarious Randall to Quinten Rollins, Jake Ryan to Ty Montgomery and Brett Hundley, Aaron Ripkowski, Christian Ringo, and Kennard Backman. All gone. It wasn’t just the Packers, however, that year. Three of the top seven picks already changed teams. Dante Fowler, Jr. (3), Amari Cooper (4), and Kevin White (7), and almost half of the rest of that first round. By the way, new addition Preston Smith was the Redskins pick at number 38. David Johnson went at number 86, Danielle Hunter at 88, Trey Flowers at 101, new additions Za’Darius Smith at 122 and Adrian Amos 142, Stefon Diggs at 147 and Brett Hundley 148. Anyway, to my guy, Maxx Williams. Obviously, Williams has not flourished in Baltimore. But I am selling the fact that that offense is not conducive to receiving prominence. Name a receiver or tight end who has done well there in the past few years. That offense, and passing game in particular, has been awful. Joe Flacco has been let go, and Raven fans aren’t even sad to see him go. A year ago, another former highly-touted tight end, Eric Ebron, was let go by the team who drafted him as his rookie contract had expired. Ebron, remember, was selected number 10 overall, before Odell Beckham and Aaron Donald, in that 2014 NFL Draft but hadn’t come close to living up to those lofty expectations in Detroit. Even with a former number one overall draft pick at QB in Matthew Stafford. Even with a QB who had thrown for over 5,000 yards one season in his career. Ebron signed with Indianapolis last off-season, and he promptly showed why he was graded so highly entering the NFL. Ebron led the team and NFL tight ends in touchdowns right away with 13 scores, on 66 catches. He had totaled 11 touchdowns in his four years in Detroit. See how a change of scenery and an upgrade at quarterback can boost a player to more like what scouts had predicted for the player originally? I believe Williams can be another guy like that. The video above compared him to Greg Olsen, who had left his original team Chicago after his first four years. He went to Carolina afterwards with Cam Newton his whole career, and he put up 37 touchdowns as a Panther, and back-to-back-to-back 1,000-yard seasons from 2014-2016. He was the first tight end in NFL history with three consecutive 1,000-yard seasons. I’m not saying Williams is going to come in and put up a thousand yards. But I do believe he can come in and upgrade the position. He could put up some Mark Chmura type production. Chmura, from 1995-1998, put up consistent numbers and was a threat on third downs and in the red zone. Again, I know his numbers in Baltimore are nothing to tout. But I believe what I saw of him at the University of Minnesota and what most scouts thought of him entering that 2015 Draft. Trust your eyes, a long-time scout once told me. And remember it. Williams is still just 24 years old, won’t turn 25 until April 12. He’s barely older than some rookies. The upside is still there. His talent is still clear. He still has the bloodlines. It won’t cost much, and the potential for a nice find is there. If I’m GM Brian Gutekunst, I am definitely taking a look into Mad Maxx.